Sanjay Muraw, Akash Kumar Mandal, Arkaraj Patra and Manish Kumar Sahni. "Design and Fabrication of Electric Tri-Cycle." 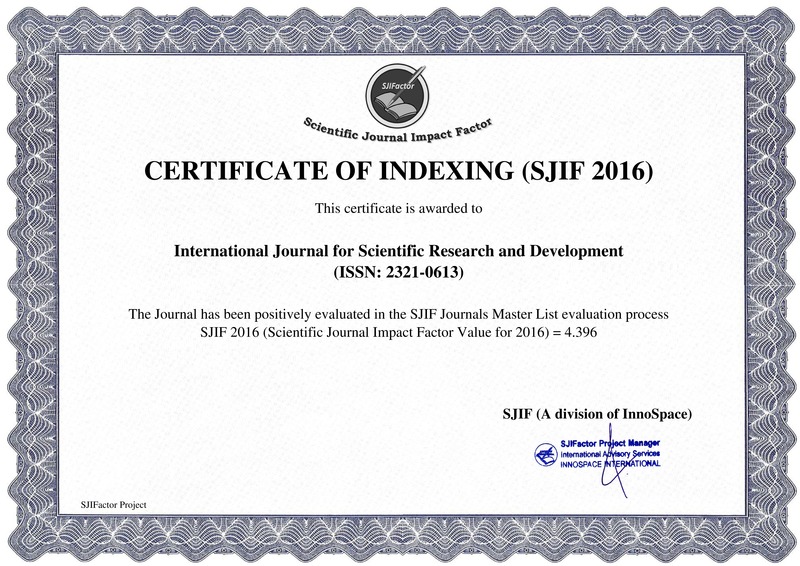 International Journal for Scientific Research and Development 7.2 (2019): 837-841. Avula Sai Babu and S. S. G. Sowjanya. "Study on High Performance Concrete using GGBS and Flyash (M50Grade)." International Journal for Scientific Research and Development 7.2 (2019): 842-846. Amisha Karia, Amit Prajapati, DhruvKumar Patel and Lavina Budhwani. "Transforming Agriculture with Technology." International Journal for Scientific Research and Development 7.2 (2019): 847-851. Mr. Nairut M. Shah, Mr. Sagar Ramavat, Mr.Vikrant Mahajan, Ms. Bhavna Kori and Mr. Jinal Patel. "Optimization of Process Parameters on Wire Electrical Discharge Machining." International Journal for Scientific Research and Development 7.2 (2019): 852-856. Swapnali Sudhakar Bhosale, Sneha Raja Ghongade and Seema Sadashiv Shinde. "Design of Smart Blind Stick." International Journal for Scientific Research and Development 7.2 (2019): 857-859. Abhineet Kumar Raj, Navendu Srivastava and Gulshan Sharma. "Partial Replacement of Fine Aggregate with GGBFS and Glass Waste in Concrete." International Journal for Scientific Research and Development 7.2 (2019): 860-861.